CesarsTechInsights: Google I/O 2013 broadcast schedule and sessions description! 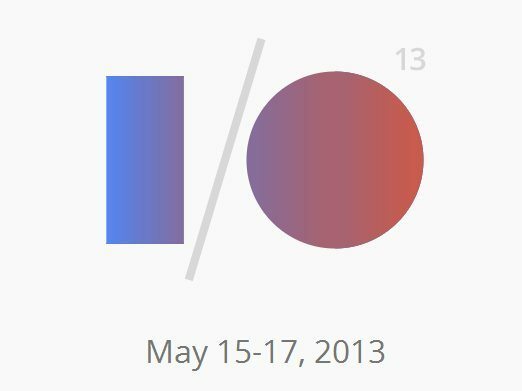 Google I/O 2013 broadcast schedule and sessions description! For those of us who can't make it to Google I/O 2013, Google has facilitated many options, one of these is Google I/O Extended, this are organized by people all over the World (click here to find the closest Google I/O extended) here you can watch the keynotes in real time, get some Google merchandize, participate in hackathons, local developer demos, meeting with the local ecosystem and even some speaker sessions with the main event! Of course Google also offers the possibility to watch the event live from the comfort of your house, actually it's going to be broadcasted from CesarsTechInsights web page! Here you will be able to watch the live sessions, read Google's official announcements and comments from CesarsTechInsights Google+ site! So feel free to post your comments there so you can interact with the staff and fellow developers who likes our site. So this is this year's sessions schedule, check it out so you can get on time for your favourite's subjects! Senior Vice President Urs HÃ¶lzle will share Googleâs vision for the next generation of cloud computing. Heâll discuss how investments in infrastructure, software and people will help usher in this new era for Google and developers around the world via the Google Cloud Platform. This session will also include announcements and demo important new features of the Platform. Animations and scrolling at 60FPS: difficult! Let's talk about rendering performance by way of a couple case studies. We'll cover the basic challenge of smooth animation, approaches to finding the bottleneck in your application using Dev Tools, and methods to cope with some common pitfalls. Topics include Dev Tools rendering features, subtleties of CSS animation, common cases that kill scrolling performance, and a peak into the hardware acceleration model that underpins Chrome's graphics pipeline. One of the top barrier to mobile commerce is the ease of paying. Whether you're selling office supplies, t-shirts, or fancy jewelry your users are faced with the same problem: providing credit card and shipping information via long complicated forms that are particularly painful to fill out on a mobile device. That's where the Google Wallet Android API comes in. Learn how you can use the API to make the shopping experience in your app simple and frictionless, and in turn drive up conversion and sales. During this session we’ll describe how to add structured data to emails in order to make it possible to present useful information to users of Gmail, Google Search, and Google Now whenever they need it. Ever try buying something on the mobile web? Combine a mess of form fields and a soft keyboard and it's more frustrating than it needs to be. How many customers don’t buy things from you because doing so is just too much work? Chrome is developing a new web standard to let users bypass pages of form fields with an imperative API for details the browser knows. In this session we'll highlight how to enhance your site with requestAutocomplete(), how to quickly implement the feature, and what to consider when optimizing the UX of your ecommerce experience. With Daydream, new in Android 4.2, an idle or docked device becomes an opportunity for your app to delight the user. But where did this feature come from? Should your app support Daydream? How easy is it to add a Daydream? How can you make yours more fun and engaging? Answers to these questions—plus plenty of ideas and sample code—will be provided for daydreamers attending this session. Location is a fundamental aspect of many location-based apps. But knowing where your user is located is only part of the story. Knowing where theyâre going and where theyâve been can fundamentally alter what you present to them. This session will explore using aspects of location to present a richer experience for users. Learn how to take your game to the next level on Google Play. Our annual game talk, with ways to power up your distribution, user acquisition, and retention. Earn the “Gold Rush” achievement. Score three stars in quality and be one of the featured games on Google Play. Megan Smith (VP, Google[x]) will emcee a series of TED talk style segments from Susan Wojcicki (SVP, Ads), Anna Patterson (VP, Knowledge), Johanna Wright Â (VP, Search and Mobile), Kathy Kleiman (Founder of the ENIAC Programmers Project), Jean Wang (Staff Hardware Engineer, Glass), and Diane Greene (Board of Directors, Google). Theyâll share their insights, learnings, and âah ha!â moments from being technical leaders inside innovative companies. Presented by Women Techmakers. On December, Google launched the Google Maps SDK for iOS. With vector maps that allow a much wider range of motion and access to Google Map data and imagery, the SDK provides a powerful way for you to build iOS apps on your platform. This session will explore different ways for you to integrate your data with a Google Maps experience. You’ve spent many long hours working on your app, but how do you turn those long days and nights into many users and plentiful revenue? Find out what’s new with AdMob, and how it can be your partner in building a great app business. Tens of thousands of ships report their position at least once every 5 minutes, 24 hours a day. Visualizing that quantity of data and serving it out to large numbers of people takes lots of power both in the browser and on the server. This session will explore the use of Maps, App Engine, Go, Compute Engine, BigQuery, Big Store, and WebGL to do massive data visualization. Ever try buying something on the mobile web? Combine a mess of form fields and a soft keyboard and it's more frustrating than it needs to be. How many customers donât buy things from you because doing so is just too much work? requestAutocomplete() is an aspiring web standard that will allow users to bypass pages of form fields with an imperative API for requesting details the browser knows. In this session we'll highlight how to enhance your site with requestAutocomplete(), how to quickly implement the feature, and what to consider when optimizing the UX of your ecommerce experience. n December, Google launched the Google Maps SDK for iOS. With vector maps that allow a much wider range of motion and access to Google Map data and imagery, the SDK provides a powerful way for you to build iOS apps on your platform. This session will explore different ways for you to integrate your data with a Google Maps experience. And that's all from the Google I/O 2013 sessions, but stay tuned for some HowTo's, Examples and insights about all this new technology on CesarsTechInsights.